I am often asked “backchannel” for gear reviews on the equipment that I use on both my expeditions and for everyday paddling trips. Please watch my blog for future reviews and send me email if you wish to see a particular item reviewed. I will indicate any conflicts of interest (sponsorships, etc) and do my best to provide an informative review. Low volume fit is great for SOF kayaks and other tight boats. Models with an instep strap stay “stuck” to your feet (even in thick muck). Razor-cut soles offer excellent traction, even on wet surfaces. Walking “barefoot” while in public feels sinfully good (you even leave a nice “barefoot” footprint). Sand is bad news. When walking in water, fine suspended sand can pack tightly around your toes and badly abrade your skin if not removed. 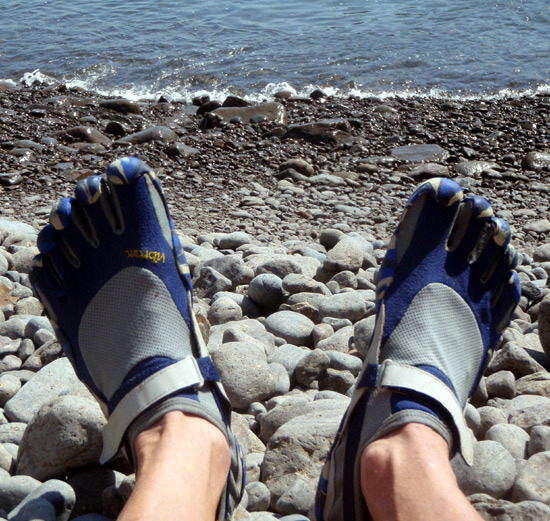 Due to the toe pockets you can’t use the shoes with any kind of drysuit that features integral socks.